MANILA, Philippines - The official results and list of passers for the Civil Service Exam CSE March 2019 Subprofessional Level in Region 4 or the Southern Tagalog (MIMAROPA & CALABARZON) are expected to be released by the Civil Service Commission (CSC) within 60 days after the administration of exams. CSE 2019 official results will also include the top 10 passers for professional and subprofessional levels as well as important announcements on claiming the CoE for successful examinees. 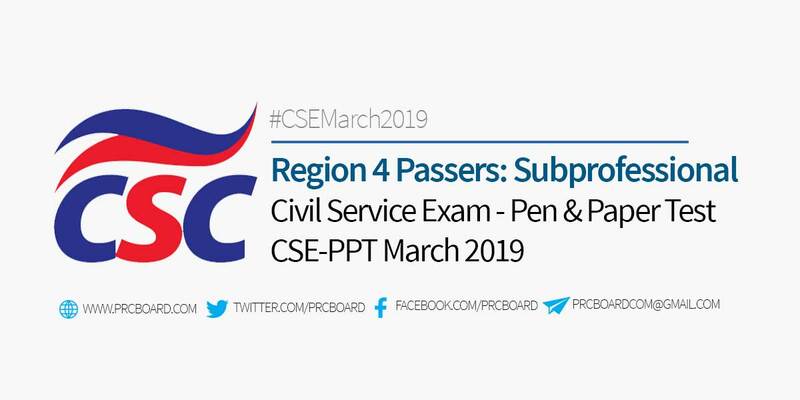 Below is the complete list of passers for March 2019 Civil Service Exam CSE - Subprofessional level in the Southern Tagalog Region, CALABARZON & MIMAROPA (Region 4), courtesy of CSC. Kelan po ilalabas Ang result..